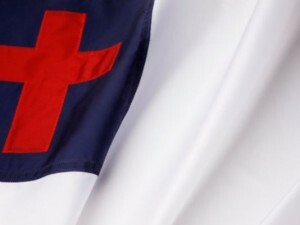 GLENCOE, Ala. — A Christian flag has been removed from its position outside of an Alabama police department after a prominent atheist activist organization sent a letter to the city, demanding that it come down. Glencoe officials have confirmed that the Christian flag—a white and blue flag with a red cross first created in 1897 to honor the Christian faith—that has flown outside of the city police department for 20 years has been removed. The flag was one of three outside of the building, including that Alabama and American flag. Mayor Charles Gilchrist told local television station WBRC that the flag was removed just weeks after the city received a letter from the Madison, Wisconsin-based Freedom from Religion Foundation (FFRF). The group stated that it had received a complaint about the presence of the flag and asserted that it was an unlawful endorsement of Christianity. Seidel contended that the flag infringes upon the First Amendment’s Establishment Clause, which reads, “Congress shall make no law respecting an establishment of religion or prohibiting the free exercise thereof.” He also argued that hoisting the Christian symbol outside of the police department disrespects other religions or those of no religion at all. “It conveys the message to the twenty-six percent of the U.S. population who are not Christians that they are not ‘favored members of the political community,'” it said. FFRF consequently demanded that the flag come down in order to avoid a lawsuit. Gilchrist said that the threat of a suit is what ultimately resulted in the removal of the flag. He told reporters that the city attorney had advised that another city went to court over a similar situation and ended up paying $500,000 in damages, plus $50,000 in legal fees. As previously reported, a city council in Georgia recently voted to remove its Christian flag from outside city hall over fears of a legal challenge. The city had received a demand letter from Americans United for Separation of Church and State, but it is unknown how much influence the letter had on the decision.